World Superbike champion Jonathan Rea pictured with Sam Geddis, Managing Director of Cornmarket Insurance Services and Stephen Watson, awards organiser. Jonathan Rea is poised to return to the glittering Cornmarket Motorbike Awards in January as a two-time World Superbike champion. The Ulster star received the prestigious Joey Dunlop trophy at the sparkling bash in Belfast at the start of this year after being named the 2015 Irish Motorcyclist of the Year. Rea only requires two more points this weekend at the championship finale in Qatar to retain his crown, when he would become the first rider since the legendary Carl Fogarty in 1999 to win back-to-back titles. The Kawasaki rider made a flying visit to Northern Ireland to officially kick-start the countdown to the biggest night on the Irish motorcycling calendar, which will once again be held at the Ramada Plaza Hotel on Friday, January 27. 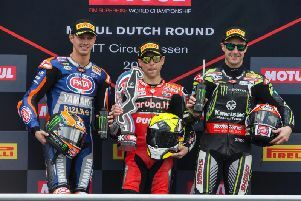 “I am excited to be going Qatar to complete what has been another memorable season, but I also can’t wait to be able to fly home from Spain in the New Year to celebrate my successes with everyone,” said Rea, who is an overwhelming favourite to hoist aloft the coveted Joey Dunlop trophy once again. “To have riders from every discipline gather underneath one roof makes it a unique occasion. It’s amazing to see the famous names on the main trophy and I hope mine can be added once again on the roll of honour. “My family has close links with the Dunlop name since my grandfather used to sponsor the great Joey Dunlop in the early days,” he added. The organisers of the Cornmarket Awards have teamed up with the Enkalon Motorcycle Club yet again, with the overall winner receiving the iconic trophy that bears Dunlop’s famous yellow helmet. The Cornmarket Irish Motorcyclist of the Year honour, presented in association with Enkalon, is the sport’s longest standing motorcycle accolade, which is voted for by the public. Club Chairman David Weir recalled some of the great names of the past to have won the title. In all more than a dozen awards, decided by a public vote and expert panel of judges chaired by former British Champion Adrian Coates, will be presented. The black tie event will welcome some of the biggest names in the sport and details of how to vote will be announced in November. Anyone wishing to purchase tickets can email tickets@bikeawards.co.uk or phone 07584058810. All details are also on available on Twitter @BikeAwards.